Lovely spacious top floor I Bed apartment with good quality furnishings and a south facing balcony with garden & harbour front views. On entering the apartment the hall leads through to the bright lounge/dining room. Sliding doors open out onto the balcony. 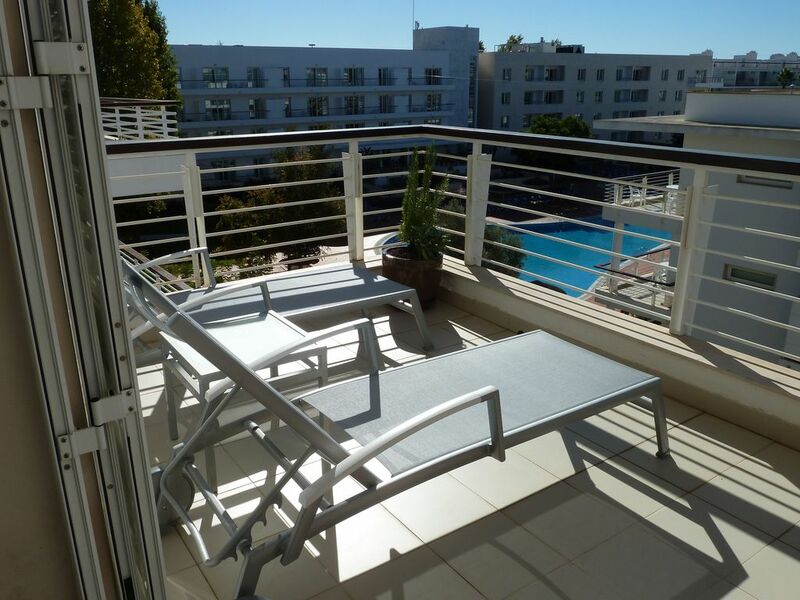 The balcony has 2 sun loungers and table & chairs for enjoying the sunset. The kitchen is very modern and well equipped. The double bedroom has plenty of wardrobe space and there is air/con fitted throughout. The apartment is equipped with personal WiFi and a small selection of English channels. The apartment comes with 2 pool passes for the Marina Club Hotel Pool. The apartment is ideally located on the Marina de Lagos and is within walking distance to beach, town centre, shops & restaurants. The apartment is situated on the 3rd floor and has a private parking space in the lock-up garage with elevator access from garage to apartment floor. The Marina itself has a 24 hour security surveillance service and there are a vast array of restaurants, cafes & bar within a 5 minute walk from the apartment. There is also a large supermarket just around the corner. There is air conditioning in lounge and bedroom. The balcony is south facing so plenty of sunshine. There are 2 sunloungers and table/chairs for dining "al fresco"
Boat trips around the grottos are available. Also boat trips around the bay including trips further out to see dolphins. We had a fab holiday, the apartment was ideal for two people and well presented. The access to beach was a walk of 15 mins pleasant and straight forward, to the other beaches/caves again walk or the local transport in the form of a train !! !....plenty excellent food places to eat and town centre just over the marina bridge. Overall only good points to say. Thank-you. Spacious Unit. Very well equipped. Amazing location. A truly enjoyable two week vacation (June 2018). Could not have asked for a better location right in the heart of the Marina de Lagos with easy (walking) access to downtown Lagos. A special thank you to Julie for being so attentive to our needs. A very competent Property Manager. Lovely spacious apartment.Very well equipped kitchen.Great balcony with sun loungers ,sun all day from 9.30 until 7.30pm.The pool was lovely with lots of sunbeds . We would have appreciated a safe and a Wifi that worked otherwise the apartment was very comfortable and close to Marina restaurants etc. Julie was extremely helpful throughout which made our holiday hassle free. The apartment now has its own personal wifi service fitted. Very comfortable apartment with spacious lounge & bedroom. Location very good, right on marina. Kitchen is well equipped although kitchen design could have been better ( more thought given to the way doors opened). Secure car parking in own basement slot was a bonus. Car isn't essential as the location is in easy walking distance to marina,town, railway station & "Pingo Doce" supermarket ( incidentally this supermarket offers good product ranges & very good prices). The Meia Praia beach is a 15 minute stroll away & is a beautiful beach. Lindas bar on the beach is a must for a lazy lunch or a lovely evening meal. "A Lota" fish restaurant ( opposite the railway station) is very good value for fresh fish. The locals use it , so it must be good. I think the apartment would benefit from a properly constructed information booklet. The picturesque town of Lagos is situated along the south western side of the Algarve. Once a small fishing port Lagos is now a very popular holiday resort with visitors coming from all corners of the world. The town is full of history dating back to the time of the discoveries when the Portuguese fleet sailed off to far away lands. The town is surrounded with magnificent beaches with fine golden sands, some of which can only be reached by boat. The old part of the town with its narrow cobbled street has hardly changed over the years, bright coloured souvenir shops can be found on almost every corner, there are a good variety of cafes with esplanades where everyone gathers to just watch the world go by. There are a wonderful range of restaurants with both local and international cuisine including fine Portuguese wines. The town boasts of a modern Marina with excellent services where luxurious yachts visit from all over Europe. Easter, Christmas & New Year rates same as September. Taxi Transfers can be arranged. Late night arrival charge (after 10pm at property) - €30 Travel Cot hire - €25 per week, High Chair hire - €20 per week Welcome packs available - Small €25 Large €50 Please contact the Manager for their cancellation policy.